The Ford brand may be laying low at this year’s Los Angeles Auto Show, but they are still making some future product noise this week with a teaser of the 2020 Mustang Shelby GT500. 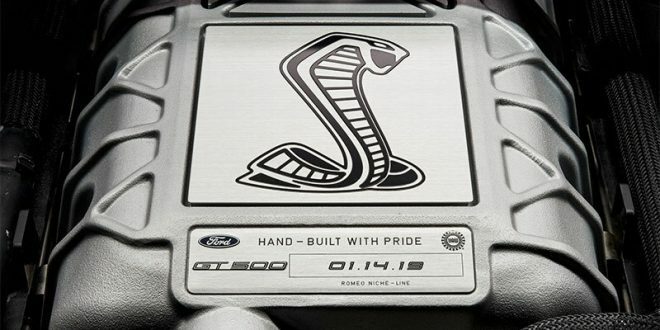 Showing off the car’s massive supercharger, we’re all getting a slight tease to what’s coming in January. Shown above, the teaser depicts the car’s Eaton supercharger packing 2.65-liters of displacement. The unit is expected to spin out 12 psi of boost to an alleged 5.2-liter Predator V-8 engine. Of course, Ford isn’t going into any specifics yet, but rumors earlier this year suggested the GT500 would have about 700 horsepower. Power is rumored to flow through a Tremec TR-9007 seven-speed DCT transmission. Also shown in the teaser shot is a confirmation of its reveal date, which is January 14th. This means the Shelby GT500 will bow in Ford’s backyard at the Detroit Auto Show.